This book will take you from the fundamentals of Statistics, Cost Estimation, Index Selection, and the Execution Engine, and guide you through the inner workings of the Query Optimization process, and throws in a pragmatic look at Parameterization and Hints along the way. Get your free PDF download here. 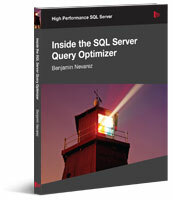 A better understanding of what the Query Optimizer does behind the scenes can help you to improve the performance of your databases and applications, and this book explains the core concepts behind how the SQL Server Query Optimizer works. With this knowledge, you’ll be able to write superior queries, provide the Query Optimizer with all the information it needs to produce efficient execution plans, and troubleshoot the cases when the Query Optimizer is not giving you the best plan possible. With over 15 years of experience in the use of Relational Databases (including SQL Server since version 6.5), Benjamin has watched the SQL Server Relational Engine grow and evolve. His insight will leave you with an excellent foundation in the practicalities of the Query Optimizer, and everything you need to know to start tuning your queries to perfection. Benjamin Nevarez is a database professional based in Los Angeles, California. He has more than 15 years of experience with relational databases, and has been working with SQL Server since version 6.5. Benjamin has been the technical editor of the two latest books by Kalen Delaney, including “SQL Server 2008 Internals.” He holds a Master’s Degree in Computer Science and has been a speaker at several technology conferences, including the PASS Community Summit. You can read Benjamin’s blog at www.benjaminnevarez.com. This is going to be one of the most interesting book around! I was wondering if there is a new publish date for this book. Have have not been able to find a copy anywhere. Is there an ebook version available for download? I noticed that most of the Red-Gate books are paperback now. That’s too bad, since shipping will cost me more than the book itself. This is a great book. Thank you Benjamin. I already had my own heuristics and guidelines for optimizing DDL and queries, but Benjamin’s thorough explanation of the SQL Server optimization is still welcome and informative. The author really did a lot of work in writing the book as he has many detailed examples interleaved with the prose. Highly recommended!